Another dirty cross-check and another two-minute minor penalty. Seriously, Dallas Stars defenseman Johnny Oduya's dirty cross-check on Minnesota Wild forward Zach Parise is only worthy of a two-minutes penalty. The ref was standing right there. This is a blatant dirty, bush league move is worthy of a look by the NHL's Department of Players Safety. These are the type of hits that the NHL should be removing from the game of hockey. The life of a hockey players is tough. It looks like Minnesota Wild forward Zach Parise lost some teeth in this incident because he bends over to pick them up off of the ice. My mouth hurts watching this. Check out the vine embedded below, it illustrates this really well. The Minnesota Wild received some bad news on the status of Zach Parise. According to Minnesota Wild coach Mike Yeo, Parise has suffered a concussion. In Parises' absence, Thomas Vanek is going to be reunited with former line mate Jason Pominville. The two played together when they were teammates with the Buffalo Sabres. This is not good news for the Minnesota Wild. Zach Parise is a key player in the Wild's lineup. The Minnesota Wild forward Zach Parise is injured and not skating at the morning practice. Hopefully, he won't be out of the lineup too long. Zach is the heart and soul of the Wild. According the Minnesota Wild, Parise will not be going on the road trip. Russo's Rants -- The Wild dropped its first home game of the season tonight to the Pittsburgh Penguins, and the biggest concern after the game was the status of Zach Parise, the Wild’s leading scorer and heart and soul. Parise didn’t emerge for the third period after sustaining what coach Mike Yeo called an upper-body injury. 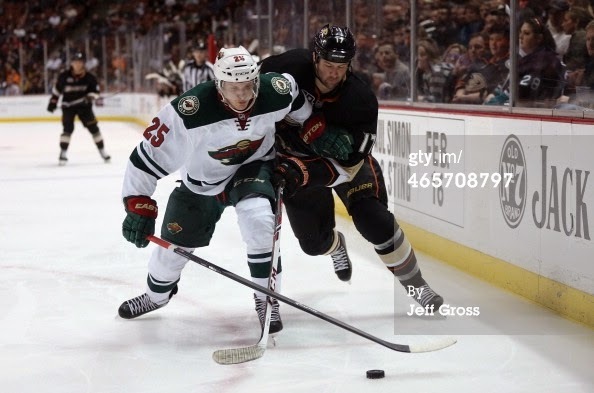 There were two big collisions I remember with Parise tonight. One came his first shift when he was bowled over from behind by Robert Bortuzzo. The other came 5:44 into the second when he was cross-checked the ice by Blake Comeau in the slot. Comeau received an interference penalty on the play. So perhaps the injury stemmed from one of those two hits. Yeo didn’t reveal the seriousness or nature of the injury postgame. He said he hoped to have a better update after practice Wednesday and said “I sure hope not” when asked if he felt it was serious. The Wild does leave after practice for a trip to Ottawa and Montreal (it’s actually a 3-game trip that also goes to Parise’s old home, New Jersey, but the Wild returns to Minnesota for a day-and-a-half after the Canadiens game), so the hope obviously is that Parise is on that charter to Canada’s capital. RT @BlountStrib: Parise not on ice at Wild practice Wednesday morning. Yesterday it was announced that Boston Bruins defenseman Torey Krug will be out for 2-3 weeks with a broken finger. Now we know how Krug broke his finger, watch the slash from Minnesota Wild forward Zach Parise. s/t to Chris Peters. Former UND All-American Zach Parise isn’t a fan of the dump and chase. I know a few UND hockey fans that will agree with Zach’s opinion. This has been a topic of much debate on Sioux Sports. Me personally, I know why you see the dump and chase in college hockey. I have seen UND run it from time-to-time. College hockey teams tend to lineup at the blue line and it’s tougher to just skate across the blue line. If they refs aren't calling the obstruction closely, and they're letting the players "play the game", sometimes teams will have no choice but to dump and chase the puck in to the offensive zone. It is what it is. The NHL is a much different game than college hockey, and I don't see the dump and chase going away anytime soon. Personally, I am not a big fan of the advanced stats either. In a nut shell, the stat that matters the most is wins and losses. Also, goals and assists are what drive a hockey player's salary. Ugly wins count just as much in the standings as pretty blow out wins. Even more reason to be positive about the upcoming 2014-15 season. Parise scored 33 goals during the 2013-14 season and playoffs.